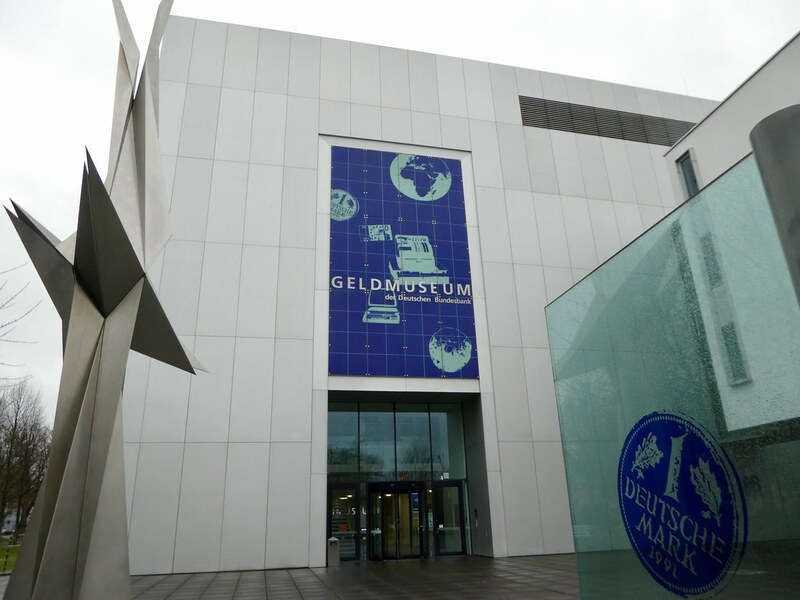 After visiting numerous other Money Museums around the world, we were eager to find out how the Money Museum of the Deutsche Bundesbank compared. We read that the museum’s aim is to inform about the function of money, the tasks of the central bank and the importance of monetary stability. This sounded interesting so we picked up a map from the information desk and began our self guided tour. 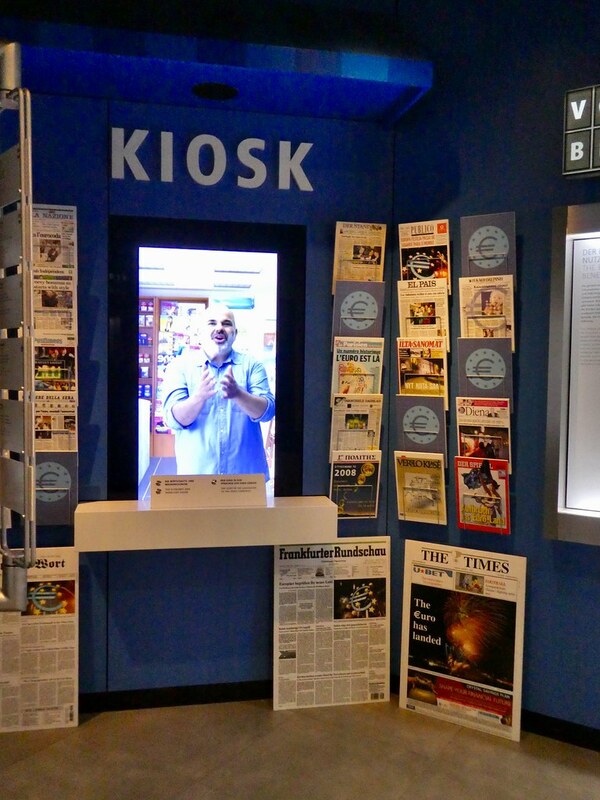 The museum has a circular design with the outer ring presenting current topics demonstrated by examples of every day lives. The inner circle is devoted to the past from the origins of modern banking. 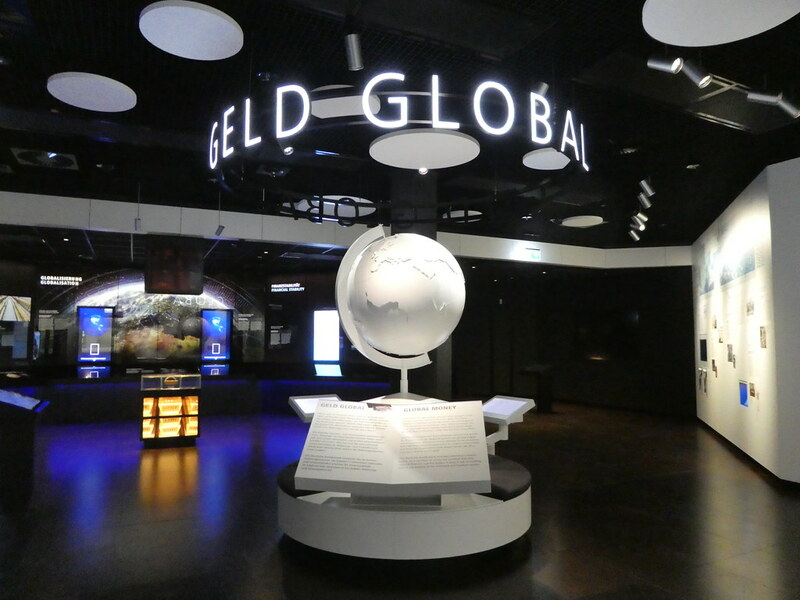 The galleries are divided into four sections covering Cash, Book Money, Monetary Policy and Global Money with information boards and interactive screens making it accessible for both children and adults. We completed our tour with a visit to the 360 degree cinema where we were able to select from a collection of twelve short films and sit in comfortable swivel armchairs to view all parts of the screen. After leaving the museum it didn’t take too long to return to our hotel to collect our bags and then walk the short distance to the Hauptbahnhof for a train back to the airport. Single tickets cost €4.95 each and do not need validating before boarding the train. Passengers can take both line S8 and S9 to the airport and these both depart from the same platform but please be aware that a third train also departs from there that does not stop at the airport. Trains run every 15-20 minutes with the journey taking approximately 16 minutes along the 13km route. Once we had arrived at the airport’s regional station which is located below Terminal 1 we followed signs to the Skytrain monorail which is free of charge and connects to Terminal 2 in only 6 minutes. 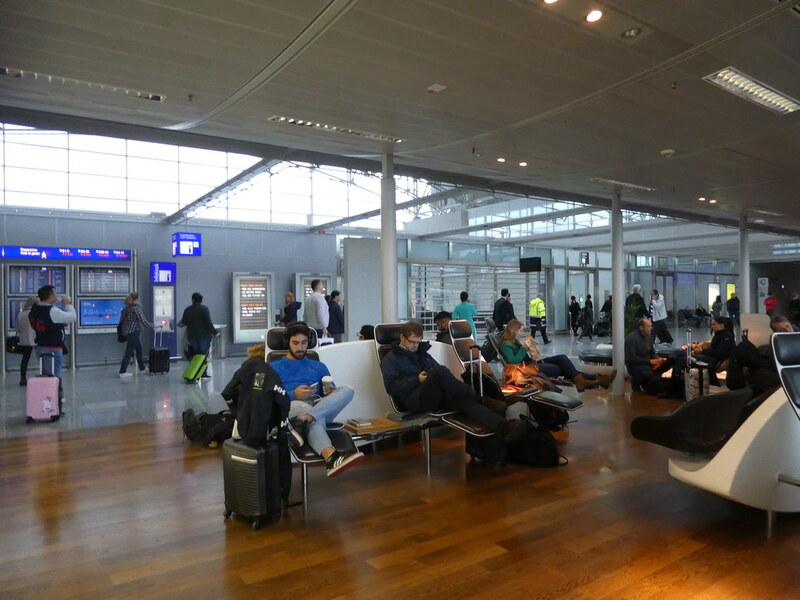 There were no delays passing through security and soon we were waiting to board our flight back to Manchester. As with our arrival, it was necessary for us to take a shuttle bus out to the aircraft as it was positioned on a remote parking stand at the far side of the airfield about 15 minutes away. 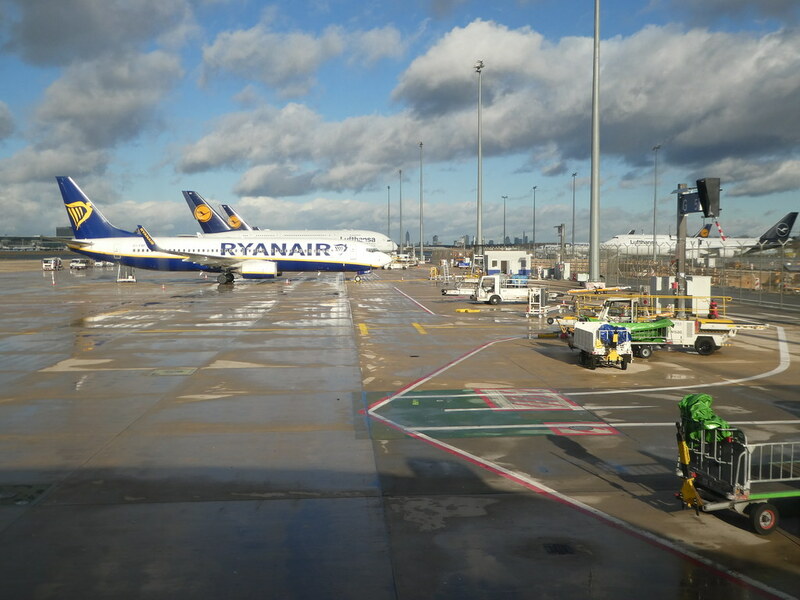 Unlike our outbound flight, the returning aircraft had a light load and we had plenty of room to spread out on the short one and a half hour flight back to Manchester. Visiting Frankfurt for a short break in winter had been a good idea as we had found numerous interesting things to do which included visiting museums, taking a sightseeing cruise along the River Main, exploring the charming old town and of course sampling the local frankfurters and schnitzels. I’m sure it looks even nicer in summer so hopefully we’ll have an opportunity to return sometime and enjoy riverside walks and eating out on the flower decked terraces. I would like to thank Visit Frankfurt for helping to make this trip possible and, as always all views and opinions are entirely my own. Thank You for this interesting post to me. Although we have been really many times in Frankfurt, we have not visited this. I think that I have told You about our clothes shopping trips there. As Suvi said clothes are there cheap, but it is not all. German people require quality!!! Also, they fitting sizes for everybody! Important to us. There is one long street full of shops, but we visit genrally only in two of them after finding the best shops for us! Thank you for taking the time to comment on this post on Frankfurt Matti. Next time I visit Germany I will make a point of visiting some of the clothes shops and hopefully I’ll find something nice too. Nice pics you got here I think your travels will inspire those who have desires of travelling to work hard and make sure they get to realise their dreams just by looking at your pics and realising what they are missing out. Thank you for your kind words. I do hope that my posts persuade more people to work hard and then enjoy their leisure time travelling. I love Germany! It’s so much cheaper than Finland and there’s many interesting sights and museums all over the country. I haven’t been to Frankfurt though – only the airport. I am looking into München being my next German destination. Lovely short break Marion. From Australia I find it wonderful that you can ‘pop’ to Germany for a few days. It would take me days to get there from here!!! Thanks Sue for your kind words. We are fortunate to be near enough to be able to visit other European countries so easily but you also manage to get around quite a bit from Canberra too which is so nice. Thank you Rebecca for your kind words and for the nomination. I’m very honoured and will certainly check it out. Marion. I would find this museum trip very interesting. It would be a brief overview of a course in economics from your description. Wonderful! Thank you Ian. The Money Museum was very interesting and a bonus, it was also free! Sadly not, but several years ago when we visited the Museum on the Mound in Edinburgh, (the Lloyds Bank Museum) handed out chocolate money if visitors were able to answer a question correctly ! It’s been a great trip, enjoyed reading all your posts on Frankfurt. Where to next then? 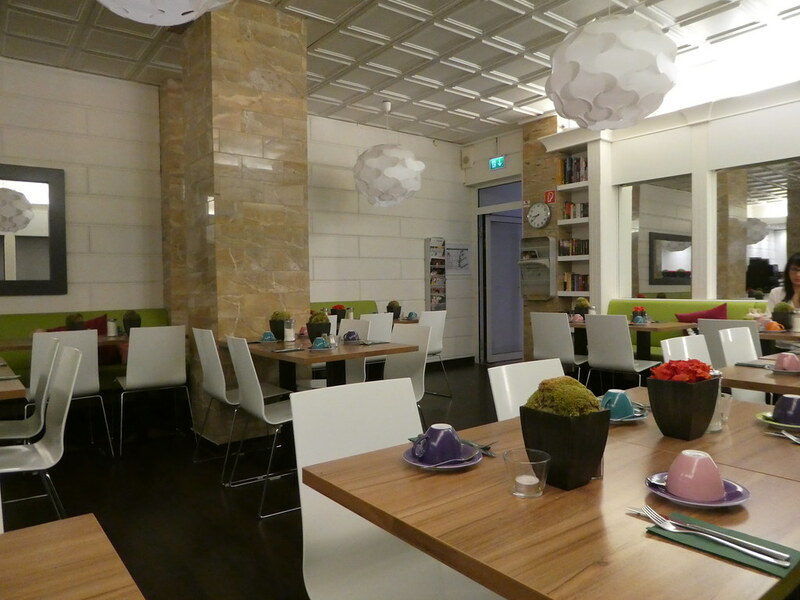 Thanks Jonno, it’s so good to read you enjoyed this series of posts on Frankfurt. I hope you get a chance to go there yourself soon. As for the next destination, it’s a little nearer to home! Stay tuned to discover where.